A towering cake will always be the confectionery star of a wedding, but it doesn't need to be a solo player. Marriage, after all, is traditionally the start of cohabitation. From pies to tarts and even a doughnut or two, the options for an Island dessert buffet are plentiful. 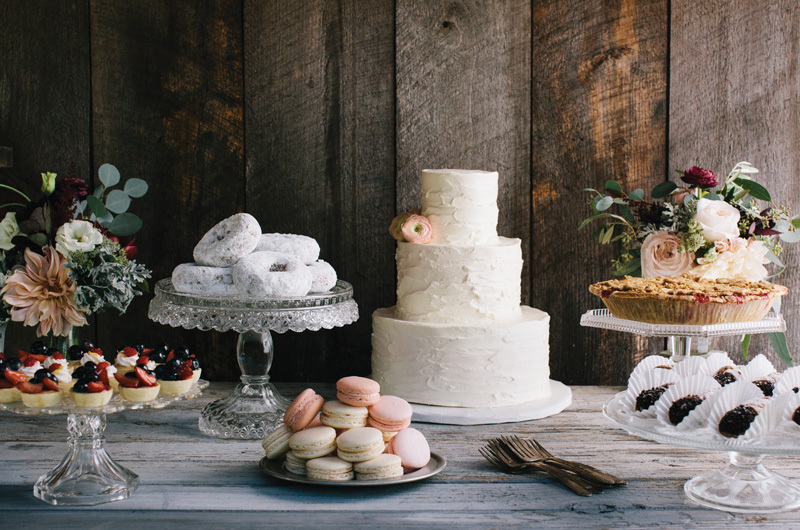 "These past two or three years the dessert buffet is becoming de rigueur for the wedding establishment," said Laura Beckman, pastry chef for The Black Dog Bakery and Café. Besides cake, she has whipped up mini cannoli, eclairs, pumpkin cheesecakes, and even fifteen or so different kinds of pie for weddings. "Not everybody likes cake," she said. Dessert spreads, on the other hand, are "fun, and it just plays well." 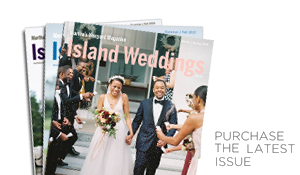 Although some couples decide to skip cake entirely, most people opt to get at least a small one for cutting, in addition to other sweets, said Island wedding planner Patrie Grace. She's seen everything from assorted candies to brownies, lemon squares, and gelato. The little bites are fun, easy to eat, and require cocktail napkins instead of additional dishware. "I think it in part has to do with the flow of the evening. It's nice to have a fun dessert station. People can dance, take a little something, then keep dancing…it keeps the evening going longer." It's your wedding day, so make the most of it. For one night only, you can have your cake and pie and cookies and doughnuts and cannoli and eat them too. Martha's Vineyard Gourmet Cafe & Bakery (better known as popular summer destination Back Door Donuts) has long been baking for weddings, owner Janice Casey said. Though buffets of doughnuts with coffee and tea at the end of the celebration are traditional, lately the bakery also has been asked to provide doughnuts as the main dessert, or in addition to a cutting cake. The bakery makes smaller versions of its popular apple fritters for weddings, and also offers its full doughnut menu, from cinnamon sugar to frosted. Couples can opt for an assortment or just one flavor, and can also customize sprinkle colors. The doughnuts are delivered straight from the bakery, often still warm. Humphreys Bakery also supplies old fashioned and Boston cream doughnuts, and State Road will whip up its popular Limpopos, which are fluffy and sugar-coated. Cookies have a special place at weddings, said Valerie (Val) Stoyer, owner of Val Cakes, who has gained a following for her delicate and delicious French macarons. The salted caramel, raspberry, pistachio, and lemon flavors are her most requested for weddings, she said, and the colors look good together, too. But any macarons, regardless of the flavor, can be made in the color of your choice. Stoyer also offers buffets of cookies, including favorites like chocolate chip, sugar, and peanut butter, and her flavored shortbreads, which are great for "a little late-night thing after dancing." Iced cookies, such as Vineyard-shaped treats, are usually more expensive and reserved for guest favors, she said. But she and others agree that almost any request can be met, from New York–style black and white cookies to apple hand pies. "I'm pretty flexible," Stoyer said. "I'm a pastry chef first." Cakes by Liz and The Black Dog also provide a range of cookies for weddings and parties – as does your favorite Island bakery, coffee shop, or restaurant. All you have to do is ask. Mini cake bites, cannoli, cream puffs – just about any dessert can be made bite-sized, called a petit four, and presented on a buffet. It's the martini of the dessert world. "We've done a cake on top and strawberry shortcakes in little baskets," said Liz Kane of Cakes by Liz. "People love that kind of stuff; it's a little different, you can help yourself." Beckman said one couple recently asked for mini pumpkin cheesecakes and cannoli, while Stoyer said cheesecakes, chocolate-dipped strawberries, and cake pops are popular. Kane has been asked to create a wide assortment of desserts in addition to – or in place of – the cakes for which her business is named. Key lime and lemon tarts are the most popular, she said. One recent wedding featured a stand with a flourless chocolate cake on top, paired with small fruit tarts and lemon tarts topped with fresh berries. "It was really cool," said Kane. Stoyer said her berry-and-cream tartlets (pastry cream topped with raspberries, blueberries, and strawberries) are colorful and tasty options. Pie is a popular option for people who want something traditional but also a little bit different, said Pie Chicks owner Chrissy Kinsman. "It evokes a feeling of nostalgia and family traditions. It's a good thing to have at a wedding." Kinsman said she's seen wedding business pick up the last few years, and typically decorates wedding pies with flowers and hearts. She can also make specially decorated pies for cutting in lieu of cake. Strawberry rhubarb and key lime are her most popular options for summer weddings. Beckman said a fall wedding had more than a dozen pie options, from peanut butter to pumpkin. Morning Glory and Little Rock Farm also offer fresh-baked seasonal pie assortments.